We’re excited to announce the opening of registration for a new youth basketball league in the San Lorenzo Valley. The league serves boys and girls, 3rd through 8th grade. 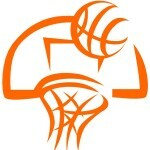 The new basketball league is a non-profit organization and all proceeds benefit the program. Fee includes t-shirt and team pictures. All practice and games at SLV Middle and High School gyms. SLV Youth is pleased to announce the formation of a new youth basketball program in the San Lorenzo Valley. SLV Hoops will support boys and girls grades 3-8 during the recreation season and grades 8-12 during the competitive season. As the recreation basketball season gets under way we will be announcing more details for the program. To receive regular updates subscribe to the SLV Hoops newsletter – locate on the right of this page. Provide a healthy and nurturing development zone for youth in and around the San Lorenzo Valley community. The emphasis is on learning, teamwork and sportsmanship. SLV Youth is a not for profit corporation using sports, recreation and competition as a means to develop youth.